Project entries are judged by project descriptions, digital images and supportingdocumentation. The judges score each project entry following the category criteria from theCall for Entries on-line entry form. Points for each criterion range from one to six depending on the judges' discretion on how each project entry successfully meets the category criteria. The Grand Georgie Awards® are determined by the average of points from the top three projects listed in previous categories as well as a review of all materials by the judging panel. Results will be based on 50 percent from the average of the top three (3) projects, and 50 percent will come from the entrant's written submission. Avid® Ratings Canada polls the homeowners and renovation clients and tabulates resultsbased on surveys. The participants with the highest Avid® Index scores will win the Georgie Award for the relevant Customer Choice category, providing their Avid® Index score meets orexceeds the 75th-percentile threshold of Avid Index scores from Avid’s national database forCanada. Builders who use Avid's services, also have access to a comprehensive, real-time, on-line reporting system that displays the results from their customers' surveys. For the 2014 Call for Entries, we have removed the requirement in the Renovator of the Yearand Large Volume Builder of the Year categories to have a customer choice component,however, Avid® is offering entrants an enhanced feature for Georgie Awards® entrants whomay wish to utilize their service. 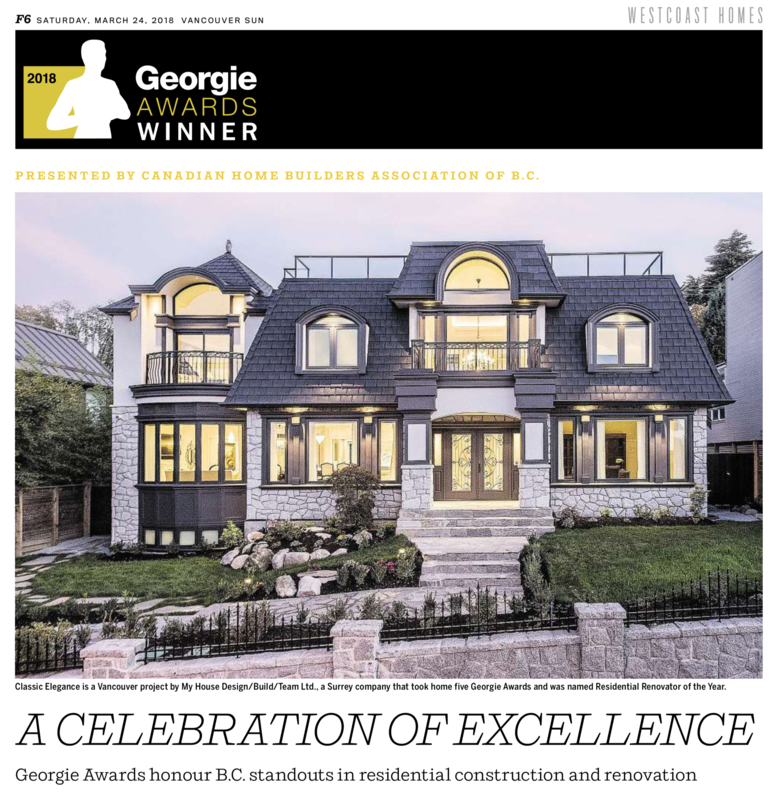 In 2010, The Canadian Home Builders' Association of BC partnered with Avid® Ratings tocreate the Customer Choice Georgie Awards® powered by Avid®. Builders choosing to enterthis category are required to submit a list of all completed homes/projects that they havecompleted during the required time frame as set out by the Customer Choice Georgie Awards® powered by Avid® criteria. In each category, up to five project entries with the highest scores will be deemed the Georgie Awards® Finalists for that category. Of these finalists, the one with the highest score will winthe Georgie Award. and thank our Partner Sponsors.